He was quite outstanding in his first two starts and even in defeat in his subsequent pair, he still looked very good. On Sunday at Seoul, exciting US import Spring Back should kick off his three-year-old season with a return to the winner’s circle. Spring Back debuted last July with a facile nine-length win in a sub-one-minute time (fast for the Seoul sand) over five furlongs. The Gemologist gelding then proceeded to record one of the fastest times of the year over 7 f when following up with a three-length score at the beginning of October. He’s back into class 3 on Sunday for the 6 f race 10 and with Moon Se Young in the saddle, Spring Back should be returning to winning form. Among the eleven rivals he faces, Munhak Tsunami, an also ran in that Nonghyup Chairman’s Trophy, looks the biggest danger. Moon doesn’t get on the favourite in the day’s finale and feature though. 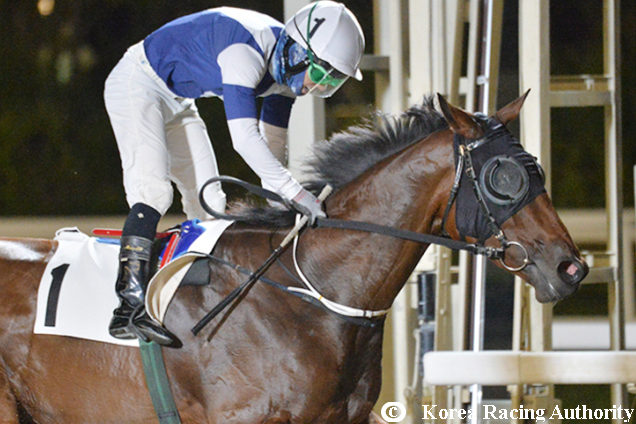 Instead, Park Byeong Yun keeps the ride on Panorama Show in the 7 f class 1 race A gelding by Yes It’s True, Panorama Show has won four of his last five and five from eight in total and the four-year-old can continue his progress on Sunday.